The Schaumburg Bicycle Club is a group of active adults who enjoy riding in Schaumburg, our neighboring communities and throughout northern Illinois and southern Wisconsin. 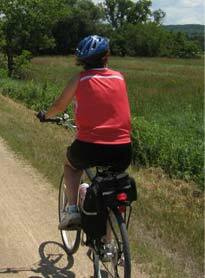 We often host rides on the nearby Busse Woods, Poplar Creek, and Paul Douglas Trails; the Fox River Trail, North Branch Trail System, Illinois Prairie Path, Great Western and other trails throughout Cook, Kane, and DuPage counties. We are predominantly trail-riders who post rides weekdays and weekends, depending on the weather and on members’ interests. We ride at moderate speeds and have a "No Drop” policy; no one is left behind on our rides. We also take occasional out-of-town trips; in the past we have spent weekends in Indiana, Michigan, Minnesota, Ohio and Wisconsin. Our club is affiliated with the League of American Bicyclists, Ride Illinois and Rails-to-Trails. We advocate to create better bicycling environments and to support safe bicycling cultures. We are a friendly group of people who love bike riding for the exercise, enjoyment of the outdoors, and a chance to socialize with like-minded cyclists.